Oh. My. GOD. I am dying over the Alexis Bittar Crystal Encrusted Wavy Cocktail Ring. DYING. Multiple faceted Swarovski crystals, randomly placed throughout an organic shape of liquid metal, emulates the feel of crumpled paper. And can you IMAGINE this ring on your finger? I sure can. The Alexis Bittar Crystal Encrusted Wavy Cocktail Ring retails for $125 and is available in sizes 6-8. Shop for your favorite Alexis Bittar jewelry at alexisbittar.com. I am a huge Alexis Bittar fan. 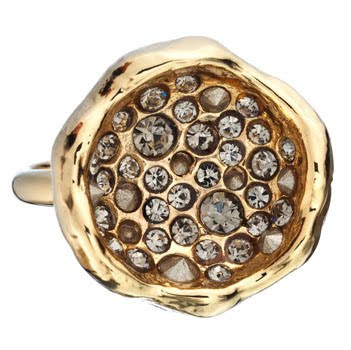 I can't even tell you how much I am lusting after the bee bracelet that is at Neiman Marcus' but it's FIVE times more expensive than this ring. Sigh.